We arrived at Twin Rivers on Thursday in a downpour. Everything was mud. Or a lake. 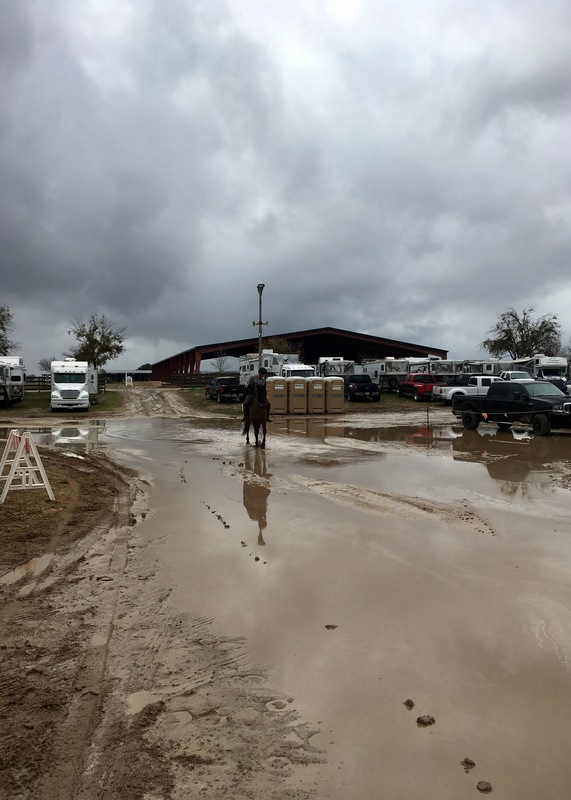 They were using sand to bank up the temporary barns to keep them from flooding and we saw a lot of people trying to cover their stalls with tarps to keep the rain out. We lucked out though and got assigned to the one permanent barn on the property. It had a real roof and an aisle down the middle and a separate alcove to store our hay in. When I checked in at the office to ask where our stall assignment was, the woman told me to “enjoy that” as I walked out. And we DID. It was absolutely the best. They were supposed to be offering a schooling show on Thursday, but had cancelled it because of the rain so my husband just went for a brief ride in the indoor to get Eugene some exercise and see how the brand new custom saddle felt. We literally stopped on the way to the event to pick it up from the saddler. To protect the saddle from the rain and his pants from the saddle oil, my husband rode in a towel. We are nothing if not classy. We got a hotel for the weekend because I’m not sleeping in the truck in the pouring rain and below freezing temperatures. We went into town to check in, grab some dinner, check out the cute tack store next to our hotel, and then returned to the horse park to blanket and feed Eugene for the night. The next morning, we awoke to find our truck tire flat and full of nails. Like a crap load of nails. We got AAA to fill the tire enough that we could drive to a tire shop where we left the truck and piled all of our crap into an Uber and arrived at the horse park much later than anticipated. 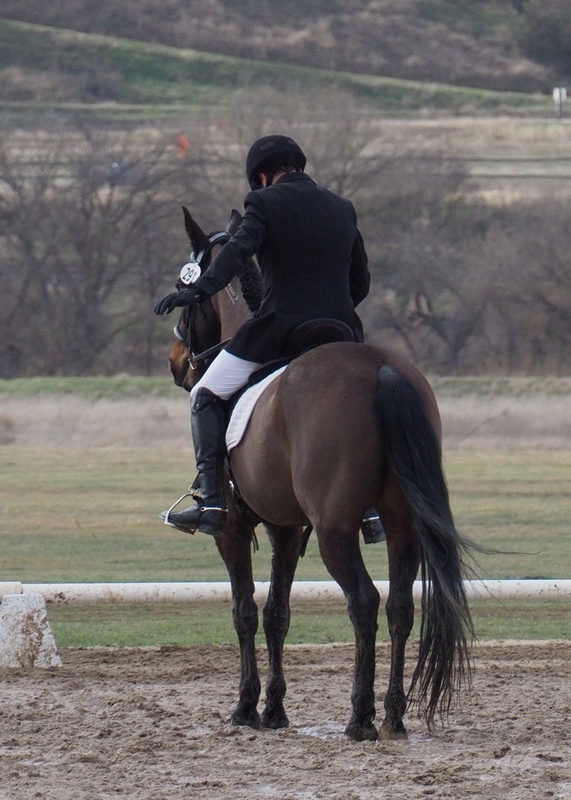 Luckily his dressage time wasn’t until 3pm. We picked the truck up later and they had to replace the tire because it had too many holes to patch. Truck tires are not cheap. Add in the Uber rides back and forth and we paid more for those nails than we did for the event itself. It briefly stopped raining when we got to the park, so my husband took Eugene out for a ride to let him stretch and get some energy out. I caught this shot of them returning from their ride through the giant puddle that was the road through the stabling area. 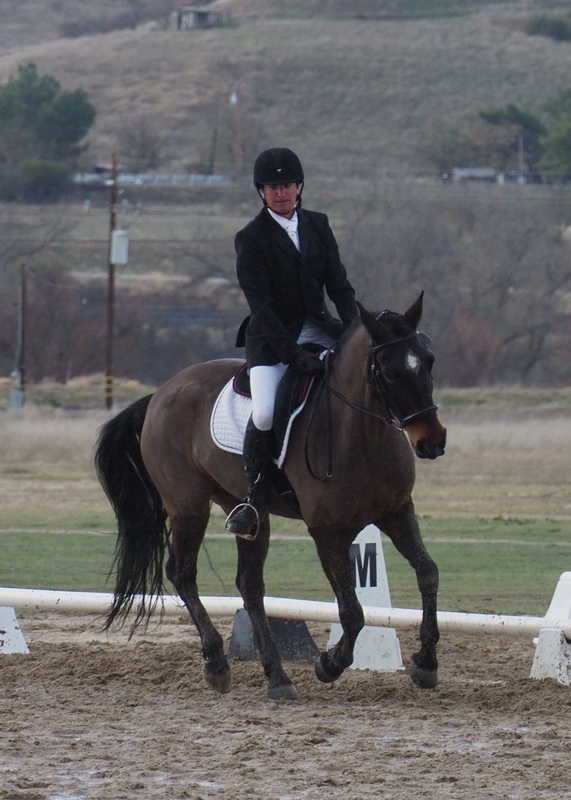 We hung out at the barn, had lunch, and braided Eugene until it was finally time for dressage. The warm up was a lake. Like a giant, mud puddle lake. I watched one horse, approach the warm up, step into the puddle, splash himself, lose his mind and bolt across the entire warm up. 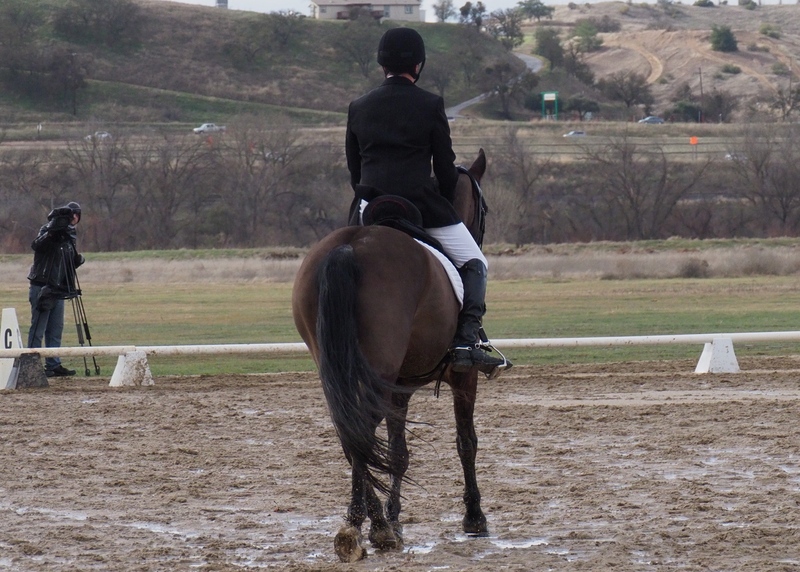 The dressage courts were also lakes of mud with puddle islands. There were a lot of very unhappy horses. I watched one poor woman try to enter at A, have her horse slam to a stop at the puddle, spin, re-approach, stop again. 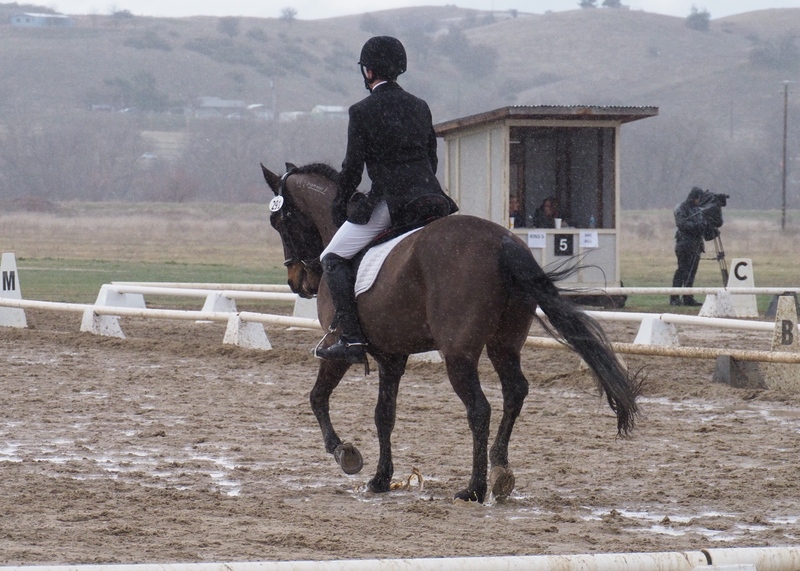 She kicked him until he tried to jump the giant puddle, splash-landed in it and proceeded to bounce out down centerline. I told my husband it was actually an advantage for Eugene. He could not care less about getting splashed. 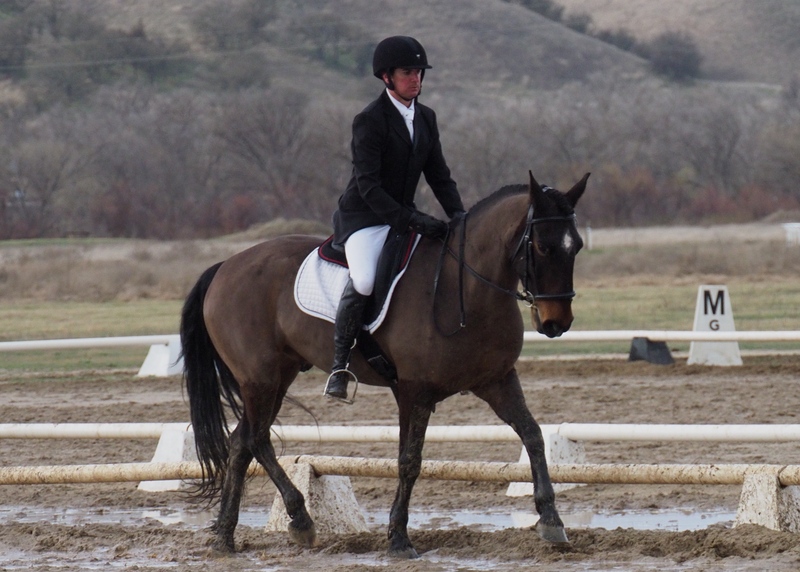 While other people were just trying to get around dressage without jumping out of the arena, they could do their test like normal and probably out score out some of the people who would normally do better than them. Just as they started warming up, the rain returned in force. 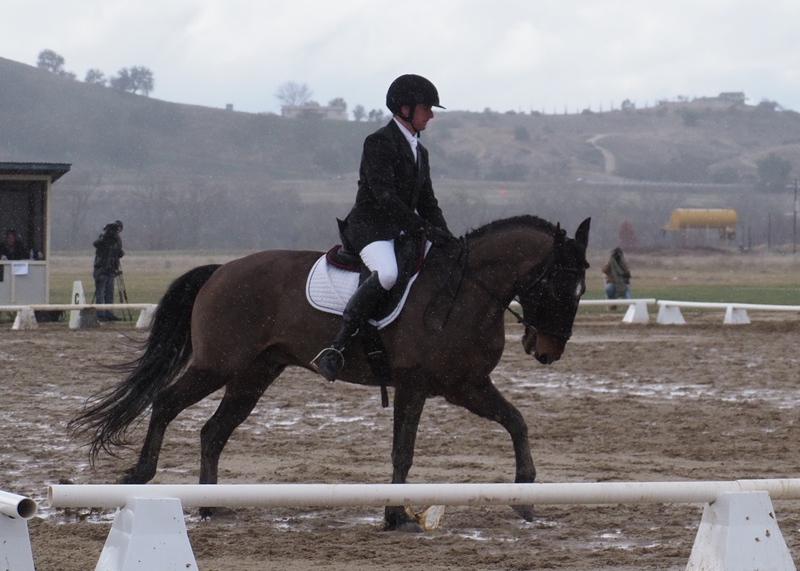 I had initially walked over to the warm up area without my rain coat, since it hadn’t been raining for a few hours, but had to go back to the barn almost immediately when the skies opened up again. I eventually moved under the tent with the ring steward to take pictures of their test. I told him during warm up that he needed to sit back. He doesn’t listen to me though, which is why it’s nice to have a trainer along. The test says halt through walk. They literally took 2 steps of walk (I have a burst of pictures showing it). This is a frustrating score to get since Eugene has a nice halt. My husband came out of the test upset and claiming it was a mess. I actually thought it was a pretty decent test. Eugene was calm and and quiet for the whole test. Their upward transitions looked good and their geometry going into the corners was much better than in previous tests. The mud was unfortunate and my husband said Eugene was tripping a bit. But I do still think it probably helped them edge out some others whose horses objected more to the rain and splatter than Eugene did. 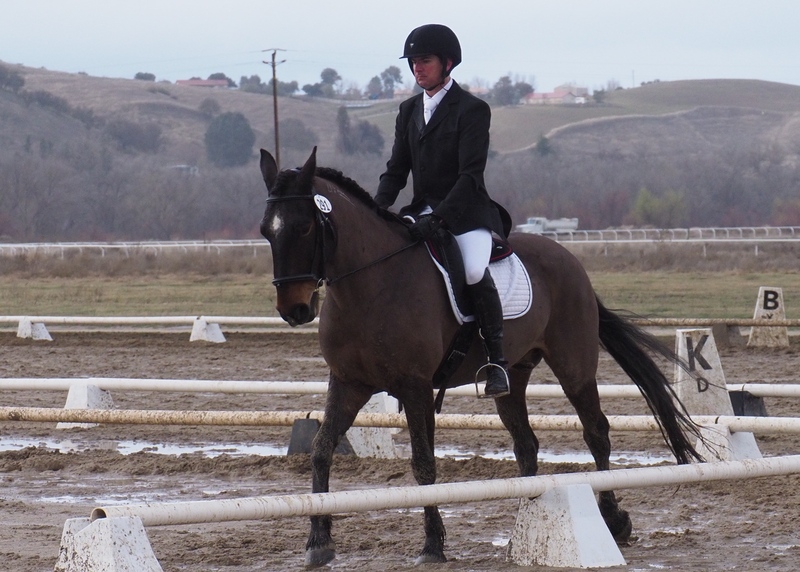 They ended up 12th out of 18, which is the the best position they’ve ever been in after dressage. 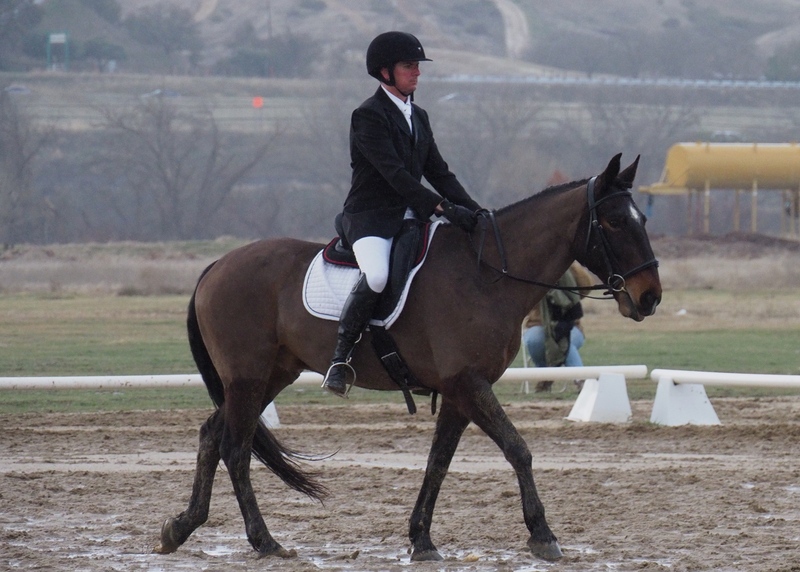 Obviously not being in last after dressage is awesome and all, but the real success here is the improvement they’ve made. This was the lowest score they’ve ever received at a rated event. They are getting better every time. They sure do clean up nicely – Eugene looks great in his clip too! And gotta love a horse who’s cool with getting a little muddy haha. Sounds like a solid start to the weekend, I already peeked at the scores so I know how it ends – looking forward to hearing about it! 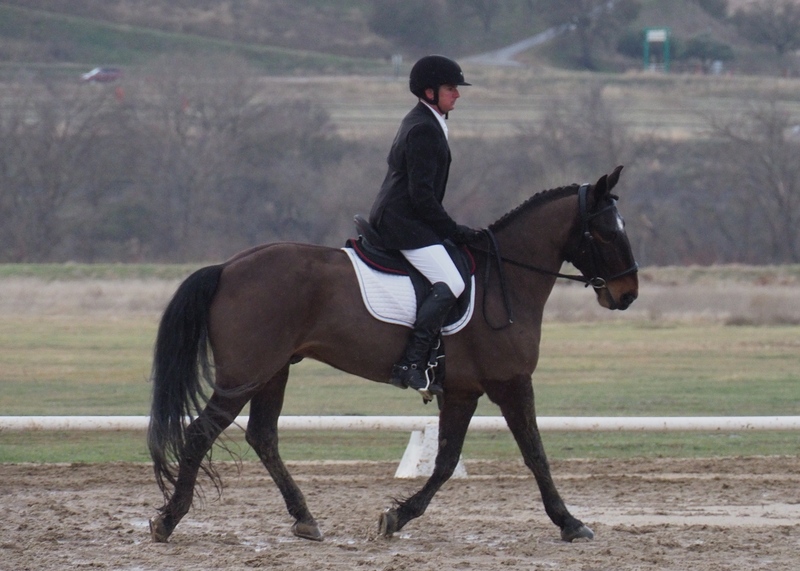 A dressage saddle and dressage bridle definitely help them look the part. ohmygod that is a muddy mess for sure! Eugene looks good and so does hubby. 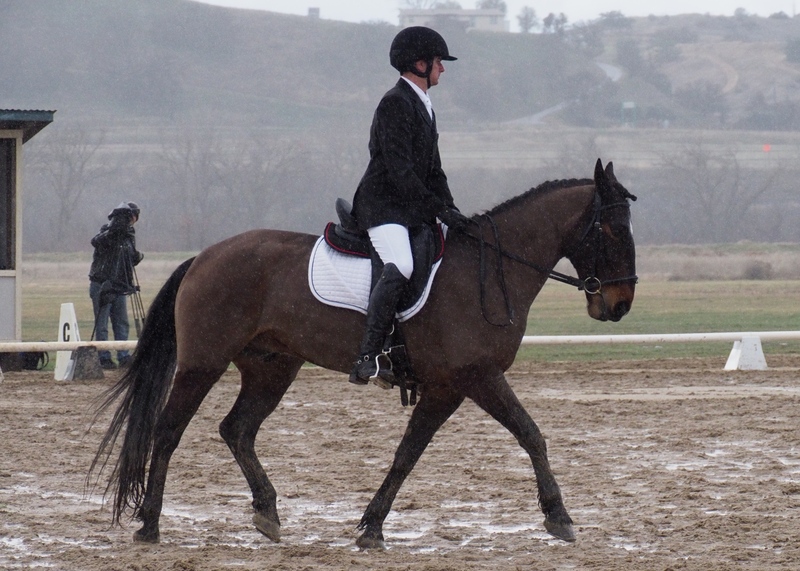 What a good boy (Both of them LOL)….that was gross to trot and canter through all that water too. ICK. It was so gross. My husband had mud all over him afterwards. All the way up on his jacket and stock tie. Looks like a good start! Even in the rain they look very classy! And the saddle looks great on Eugene too. 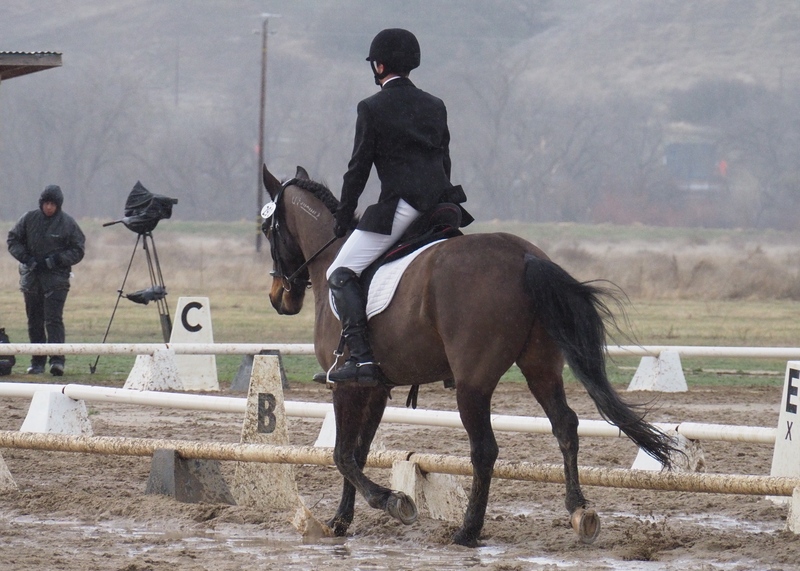 Immediately when you said it started to downpour I was like “but….the saddle!” haha. That’s just me though. I’d prefer not to get my leather wet lol. So glad that while Eugene was tripping a bit, he didn’t care about getting splashed or trudging through mud. 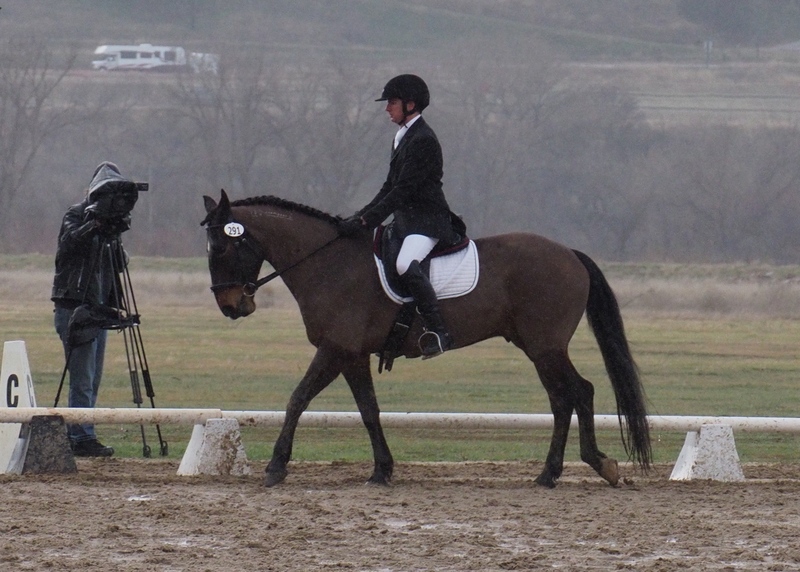 Sadly, I’m pretty sure the rulebook wouldn’t have allowed the towel during the dressage test. The saddle is so oily right now I think the rain probably bounced right off it anyway. HOLY MUD! That’s a respectable test and especially one ridden in a mud hole! And that’s a lot of nails in one tire!! So much mud. Just a giant lake of mud. I think they should change their name to ‘mudstangs.’ Looks like a great effort despite the conditions and I look forward to seeing how their other rounds went. The Mustang thinks water is a giant plaything so I don’t think he minded the lake, but I don’t think he liked getting rained on. Oh wow, I was not expecting that much water! 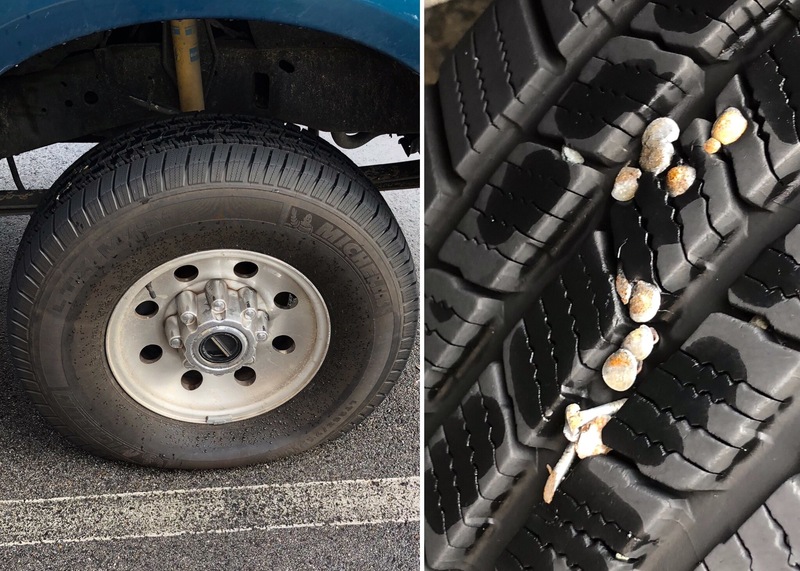 And how on earth did you get that many nails in your tire?? I would also like to know how we gained so many nails. It’s not even like it’s that easy to get one nail as they usually lie flat on the ground. Eugene looks really good here. He’s really getting past his giraffe mode. The judge should have been more understanding of riding conservative in slop though. And the 2 strides of walk?? She probably was considerate. 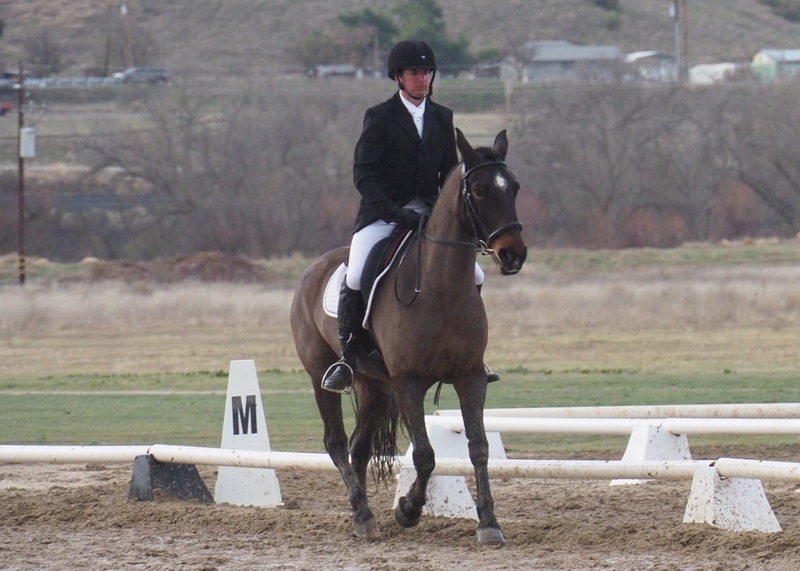 Eugene is quite pokey compared to TBs or Warmbloods. He’s just not built to move in a forward reaching way even if there were no mud, though I am sure the tripping made him more cautious. Hubs looks like a whole new rider in his fancy new saddle! They both really look great. I think it’s a little unfair to judge a slightly shorter step from a horse in that footing. 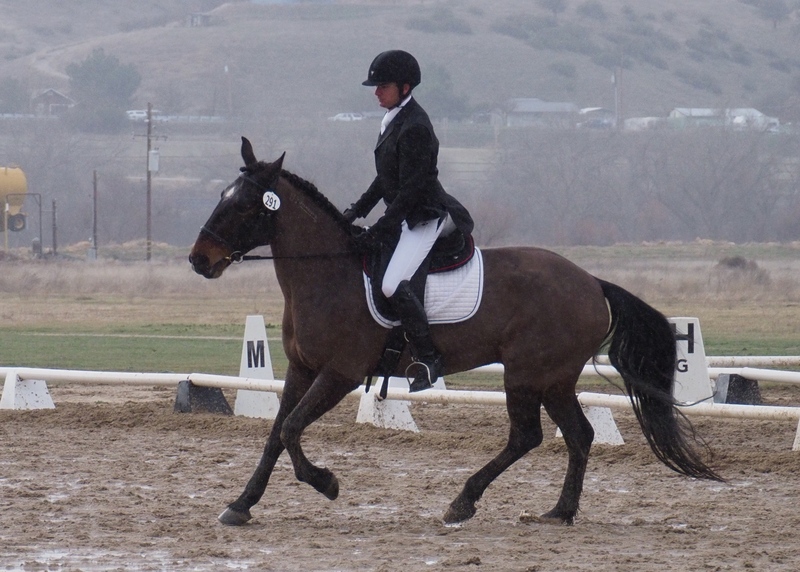 But maybe that’s why/because I’m not a dressage person. To be fair, he doesn’t step out much even when the footing is good. But it was especially hard to ask him to do so when he was tripping through inches of water. 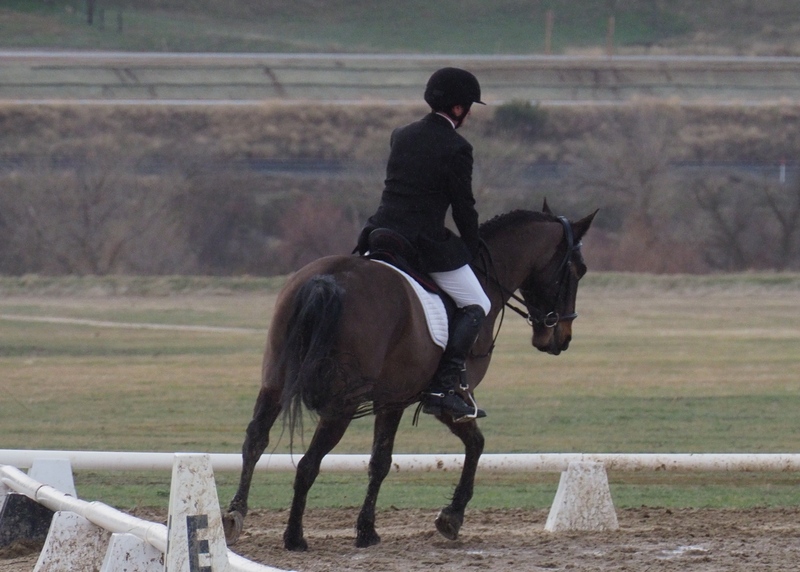 I can remember being a dressage show where the horses slid to a halt at X it was so muddy. I think he should have gotten bonus points for keeping it all together!